Maddie flew in from the garden, her eyes shining. I never saw the mouse. Maddie ministered to it all afternoon, by which time it must have felt, and possibly looked, like Henry VIII after a banquet. But I walked out about teatime to find someone else ministering to the mouse. There was an ample, baggy ginger furry behind swaying imperceptibly; rather like a golfer lining up his shot. The dog was dispatched to rid the garden of the vanquisher of my daughter’s dreams. Feeding the mouse has always been a dilemma. I can remember staying in an old house in the South of France where a mouse lived in the larder. As we drove away after a week’s holiday three out of the four members of the group admitted to feeding le petit souris. But the cat is never far away. Take a look at the mediaeval bestiaries, those gorgeously illustrated records of animals laid down by people in the twelfth and thirteenth centuries. They are full of images of cats and mice; and those hinge down seats clergymen sit on during services, the misericord? A recurring theme is the cat with the mouse in paw. Exeter Cathedral’s ancient astronomical clock is splendid indeed: yet mice were a part of its history, for they would scurry into the clock tower and nibble the ropes which held its weights. So a cathedral cat was employed, and a cat-flap cut into the door to the clock tower. A mediaeval cat flap which remains today. 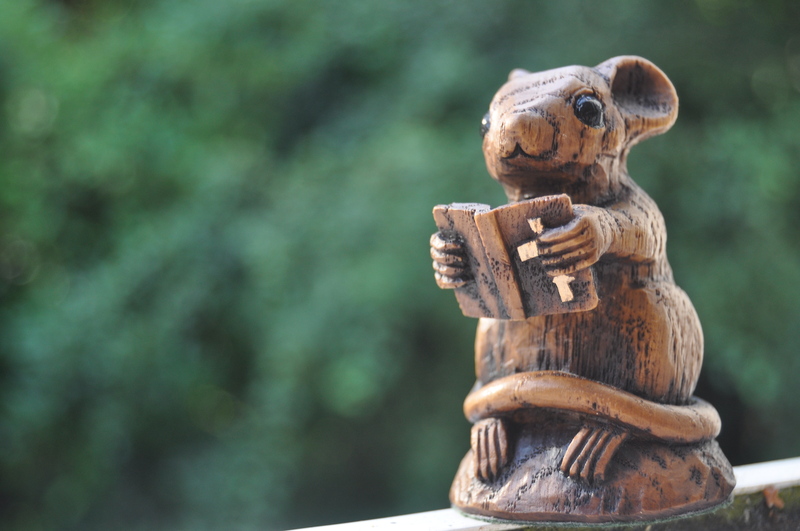 I have heard of a tradition that a small wooden figure of a mouse is hidden somewhere within the sanctuary of any church. The net reveals little about the custom. When I left work a few weeks ago, my friend Jan, librarian and overworked sub-editor of this blog, handed me a small package. It was a small wooden mouse. It was taken from a carving by a man called Nick Hunter who specialises in reproducing mediaeval carvings. The little mouse is not mediaeval,however: he is based on the saying “as poor as a church mouse.” The same saying inspired British carver Robert Thompson to include a trademark lone mouse on his furniture in the first half of the 20th century. I hied me to the nearest mediaeval bestiary to nibble on the ropes of the puzzle of the lone liturgical mouse. The mouse, said ancient sources, was born of the soil – hummus – hence its Latin name: Mus. It is a small animal, the ancients reasoned, whose liver gets larger at the time of the full moon. Pliny the Elder observes they gnaw at iron, and in gold mines they have been observed to gnaw that, so that when you cut them open there is gold in their stomachs.White mice are a good omen: and mice feed their old with uncommon devotion and affection. They conceive by licking, or by eating salt; and the mice in Egypt walk on two feet, Pliny asserts, as indeed do Alpine mice. And in some mediaeval imagery: for example images of Gertrude of Nivelles, (626-659) an abbess-turned-saint on whose robes mice nibble – the mouse is said to represent the very human soul. Thus cat-and-mouse imagery prevalent in so many churches represents the devil’s hunt for the soul. And a mouse on its own? Could it be an attempt to place the very essence of the human spirit into a towering masterpiece of stone and wood? Posted in Folk tales, Quirks of HistoryTagged carving, church mouse, mediaeval, mouse, Nick HunterBookmark the permalink. They are fascinating little things, mice, and this bit of mystery is too. Mediaeval symbolism was so earthy: close to those people who lived in daylight hours and depended on a natural world they struggled to understand, Roger. Not so much religion, as trying to make sense of it all. And the mouse stood for something, back then. This is an extraordinary post – wow! You certainly have me thinking. Glad to hear it, Julia. I believe the mouse might be an international symbol: keep your eyes peeled! Quite 🙂 Each to his own space. No, sorry, I’m struggling with this one. Mice- the real, furry ones with long tails and black eyes- freak me out. I would be the one not feeding it; I’m more likely to be calling Rentakill. Whoops! Should have put a warning at the top, Fiona! Quick, run away and think very hard about elephants. Can’t say that I care much for the little furry rascals, I much prefer the giant ones I see at Disney World. Fascinating and full of mystery, that’s what mouse is. The one I found- which has a mouse in the altar- is a presbyterian church in Albequerque! Our dogs would not let the mouse live! Although I am not a fan of those critters at all, this post actually makes me feel some empathy for them. Yet, I prefer if they stay out of my house. What’s Gertrude’s take on rats? NYC is rife with those varmints (to access my inner Yosemite Sam). I fear she is quite kind to them,LameAdventures. There is some dispute as to which is at the foot of her robe…. We judge by the size of he tails over here. Poor mousie. I hope Maddie wasn’t too upset. I love your posts, Kate, how they start with a little anecdote and then get on to the juicy history stuff. I’ve always admired Maddie, but even more so now. You see, I am the one atop of the chair, like the woman in cartoons, screaming “eeeeeek” at the sight of a mouse. I sense that they are around when no one else sees them and they laugh. My family laughs. Then they scurry when they see them too. Sigh. Fortunately, we have not seen any mice in several year – but I’m always on the lookout. Yep. Maddie is my hero. As long at the mice stay outdoors. 😀 I find myself sadly in the minority today, Penny…I shall tell Maddie she is your hero. Maddie’s enthusiasm speaks to me of how wonderful a place the world can be when we embrace it rather than see it through a filter of fear. BRAVO Maddie! Your comment warms my heart today 🙂 Thank you! I have a rahter special bread board, a wedding gift, with a mouse carved into it by Mouseman (http://www.mousemanfurniture.com/9.html – )in theory I like mice. In practice we have had mice in the house…eating soap on one occasion ad living under the dishwasher on another! not easy to get rid of! Ah, someone with a foot in both camps! I envy you that bread board…. Ellie, this is amazing. Poor cat and mouse, but what a quirk of fate. Thank you! I think mice are cute as long as they stay out of my house. I once found a couple of very young ones who’d fallen into a wastebasket and couldn’t get out. (The house mice I encounter are usually field mice seeking shelter in the fall.) They were adorable. I released them outdoors in the hope they’d survive. Love your little carved mouse. Probably the best kind — wouldn’t damage my home nor be harmed by my cat. I feel sure its where they must be at their happiest, Barbara. Duly noted, Tilly. And welcome back! Kate, a cat’s got to do what a cat’s got to do. But I applaud Maddie’s tender heart. I love your history of the lone mouse and its connection to religion. “Thus cat-and-mouse imagery prevalent in so many churches represents the devil’s hunt for the soul.” Something to think about, indeed. Rats and mice can take over alarmingly, so a good hunting cat is certainly an asset. I can sympathize with Maddie, though. They are really cute little creatures.